Today we explore some alternative ways to deal with indigestion. 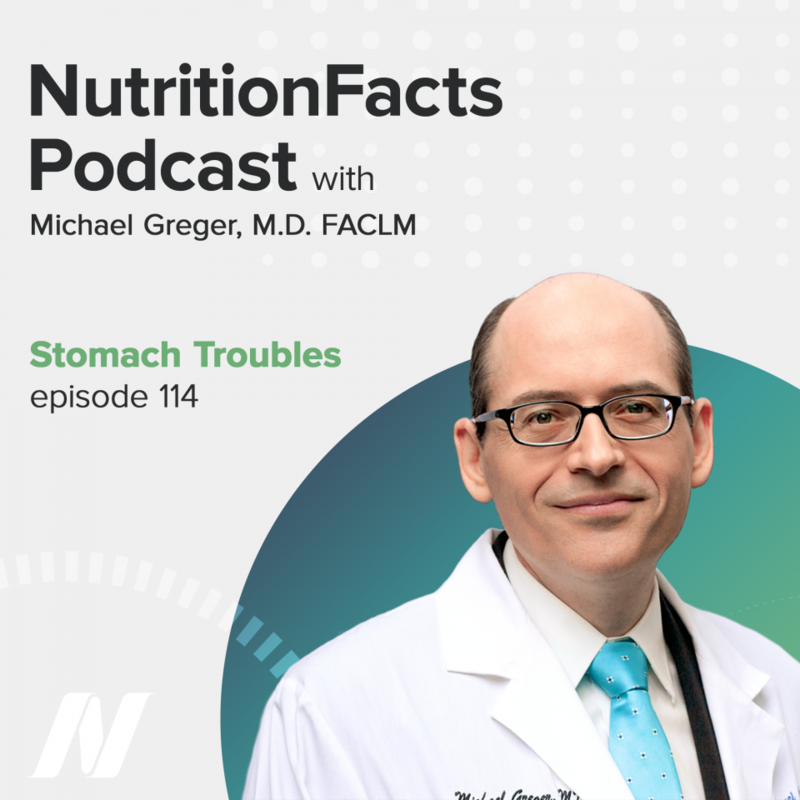 This episode features audio from The Best Diet for Upset Stomach and Are Acid-Blocking Drugs Safe?. Visit the video pages for all sources and doctor’s notes related to this podcast. Today, we look at what to do when our stomachs start to put up a fuss. First up, what to avoid and what to eat to help with indigestion. Dyspepsia is just a fancy word for an upset stomach—feelings of fullness, discomfort, nausea, bloating, belching—affecting up to one in five individuals. So, all in all, “studies have emphasized the unmet need for medications to treat patients with” dyspepsia—but why not try food? One study put amalaki to the test, which is just another name for amla. They call it an Ayurvedic drug, but it’s just a fruit—powdered Indian gooseberries. One teaspoon of dried Indian gooseberry powder three times a day versus an ounce of some gel antacid every three hours. And, both worked just as well: significant decreases in peak acid output, and a cutting of dyspepsia symptom scores in half. They conclude that amla is therefore better. It’s about a hundred times cheaper (about a penny a week instead of a dollar a week), and more convenient than downing antacids six times a day. Though amla may be a safe, simple, natural remedy, such an approach is still very much in the pharmaceutical model of treating the symptoms, rather than the underlying cause. I mean, dyspepsia is not caused by a gooseberry deficiency. What is it caused by? Well, about one in seven people describing a range of gastrointestinal symptoms feel better cutting out gluten. But for the other 86% of people, the most well-characterized trigger is high-fat meals. If you give people a fatty soup—just broth with added fat—it takes three times longer to empty from your stomach compared to the broth alone, like an hour and a half versus just a half-hour. Now, the emptying rate didn’t necessarily correlate with how people felt. But, regardless, the fatty broth “increased the severity and frequency of” dyspepsia over the regular broth. What happens in dyspepsia is people become hypersensitive to the stretching of the stomach when you eat. But, it also matters what you eat. The human stomach can normally accommodate about a quart of food; a thousand milliliters; four cups. But, if you stick a balloon into people’s stomachs attached to a hose, people with dyspepsia will start feeling discomfort at only about one-and-a-half cups, when the stomach is less than half-full. But, that’s when you’re dripping fat into their gut. If you’re instead dripping sugar in their gut while you’re blowing up the balloon, it can get up to about 70% more. And, the same with fullness and nausea. Increase the pressure in the stomach with fat in there, and fullness and nausea shoot up. With fake fat in your stomach instead, the same pressures resulted in significantly less feelings of fullness and nausea. “These studies have shown that during distension of the stomach”—as the stomach fills up—dietary fats are a major trigger of dyspeptic symptoms such as nausea, pain bloating, and fullness. And, “they modulate…symptoms in a dose related fashion,” meaning more fat, the worse people felt. These were some pretty elegant experiments, but also a bit artificial. I mean we don’t typically eat with balloons in our stomach. So, how about an experiment using actual food? They compared yogurts high in sugar/low in fat, versus high in fat/low in sugar. Eating the low-fat yogurt, there wasn’t as much difference in the nausea, pain, and bloating scores between those with dyspepsia and healthy subjects. But, give them the same amount of high-fat yogurt, and dyspepsia symptoms shot up almost immediately. So: “One of our major findings was that the induction of gastrointestinal symptoms after the test meals was ‘nutrient-specific.’ The consumption of a high-fat test meal was associated with a substantially greater increase in nausea and pain when compared to a high-carbohydrate meal” among those with dyspepsia, “with the symptoms scores increasing immediately after” eating. In our next story we look at the benefits and the risks for acid-blocker drugs, proton pump inhibitors like Nexium, Prilosec or Prevacid. Another new addition is the “stomach warning,” stressing the importance of not taking the product “when overly full with food or drink.” Why not? Well, if you’re familiar with scholastic science fair volcanoes, they’re baking soda and vinegar, right? Baking soda and acid, like what’s in your stomach. “This warning was added at the request of the FDA because of multiple case reports of spontaneous gastric rupture,” where people’s stomachs burst. But, exploding stomachs aside, even just sticking to the suggested dose may still cause adverse effects. So, baking soda cannot be recommended, especially in “young children, pregnant women, alcoholics, and those who are on diuretics”—common blood pressure medications sometimes referred to as water pills. The problem with all these studies just showing associations, though, is that you can’t prove cause and effect. Maybe taking the drugs didn’t make people sick. Maybe being sick made people take the drugs. So, maybe it’s not that these drugs are the cause of these infections, fractures, death, and dementia; it’s just that they may instead be a marker for being sicker. But, there are potential mechanisms by which drugs could have some of these effects. For example, here’s the death data. The longer people are exposed to these drugs, the higher their apparent risk of dying prematurely. But, like how could suppressing acid production in the stomach increase mortality, which is mostly like heart disease? Well, suppressing acid isn’t the only thing these drugs do. They may also cause a reduction in nitric oxide synthase, the enzyme that makes the open-sesame molecule that helps keep our arteries healthy. In terms of dementia, a key event in the development of Alzheimer’s disease is the accumulation of these plaques of a sticky protein called amyloid beta. And if you just stick Alzheimer’s-like cells in a petri dish, and drip on increasing levels of the drug Prevacid, the cells start churning out more amyloid. And the same thing with Prilosec or Losec, Protonix, and Nexium. Now, just because something happens in a petri dish or mouse model doesn’t mean it happens in a person. But, most studies to date have found this link between dementia risk with the use of these drugs—including the largest such study to date, involving tens of thousands of patients, that concluded that avoiding the chronic use of these drugs “may help prevent the development of dementia.” Although an alternative explanation of the link is aluminum exposure, which itself may play a role in dementia. And so, maybe those using acid-blocking drugs have heartburn or something, and so are also using more aluminum-containing antacids, and that’s actually the real culprit? We still don’t know. How overprescribed? “The rate of inappropriate use of these drugs” is about half. Half the people on the drugs shouldn’t even be on them. “These rates are worrying, because they mean that these drugs are prescribed for” things they shouldn’t even be prescribed for, meaning there aren’t even proven benefits to outweigh the risks.